I love taking photographs especially of little man, trying to capture fleeting moments of my precious boy to cherish forever. As I take photographs every day I decided this year that I would take part in Project 365. The concept is simple – you take a photograph a day, every day, for a year. For my first day of Project 365 I have chosen a photograph of little man having forty winks after tiring himself by playing with all of his new toys from Christmas. In a matter of seconds he went from busy play to spark out sat upright on the sofa, bless him.....being a playful toddler is hard work. 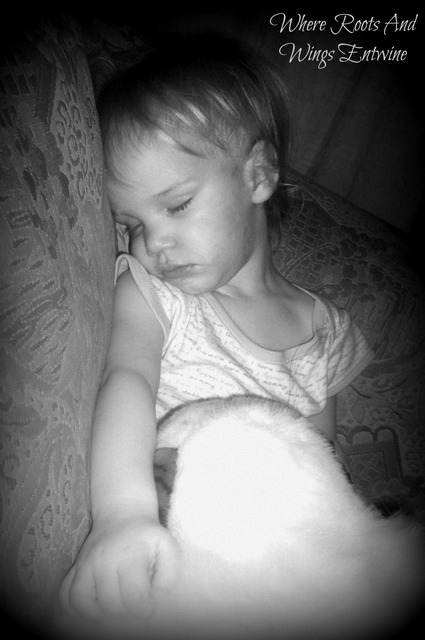 Photos of little ones sleeping are the best! Lovely photo, it's amazing how quickly they can go to sleep, isn't it? My little boy just switches off sometimes too! Good luck with your Project 365. What a beaut! You need photos like this as proof that they actally stop haring around at some point in the day! Absolutely stunning and definitely works best in black and white, photos like this tend to don't they because they let the tenderness show through. Please ditch the captcha code though? Thank you. I have a fondness for black and white photos and you are right it does help show the tenderness. Lol, it is amazing how they can go from full speedy, busy whirlwinds leaving a trail of mess and toys strewn everywhere whilst they have fun and play to fast asleep in all manner of positions in seconds. Little man has only started to crash out lately, before that he would never sleep in the day and I find it so cute the way he just falls asleep so quickly for a cat nap.